Are you looking for a bird cage suitable for your pet parakeet? What a fun and interesting pet to have, especially when they’re in a perfect home! If you’re looking for a cage-upgrade, or you’re thinking about bringing home your first parakeet and just doing some initial research, you’re in the right place. We’re going to start by looking at five of the very best cages, and then we’ll go over some common questions and things to keep in mind about this gorgeous pet. While reviewing, we considered a variety of factors: value, build-quality, and size of the cage, just to name a few. Now, let’s take a look at the best parakeet cages that you can order online. Prevue is well-known for their thoughtful design and high-quality parakeet cages. In fact, this list of the best cages includes two from Prevue, and we think you’ll understand why in just a few moments. Although it’s priced lower than its competitors, it is more than large enough for one parakeet and includes four wooden perches and two plastic dishes with covers. It has horizontal and vertical bars, so your parakeet can climb to their heart’s content and there is ample space to fly. This cage measures 26 x 14 x 36 inches with ½ inch-wide wire spacing. It has large doors on the front of the cage, giving you easy access to your parakeet. It is available in three color schemes, perfect if you want something other than the typical black or white bird cage you usually see. The extra vertical space is great for encouraging flying and helping your parakeet feel less “trapped”. The sturdy construction and inclusion of multiple perches. Your parakeet will have no trouble feeling secure in this cage. If you want a bird cage that is easy to move around, this rolling bird cage from Yaheetech is certainly worth checking out. 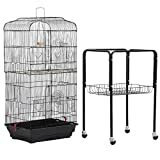 Not only does it have a secure handle for carrying the cage, it includes a detachable rolling rack that can be easily pushed from room to room thanks to its 360-degree swivel castors. The base of the cage is easily removed for quick cleaning – a feature we think is very important when it comes to cleaning up after any pet bird. This cage measures 18.1 x 13.9 x 59.3 inches with ⅖ inch-wide wire spacing. The cage is easy to move around using the rolling rack. This is a great feature that shouldn’t be overlooked if you intend to keep your parakeet in a high-traffic area in your home. The rolling rack also doubles as a storage area, perfect for keeping your parakeet’s supplies neat and organized. There is plenty of space for hanging up toys, mirrors, and perches, so boredom will be a thing of the past for your parakeet. While this cage isn’t the widest choice, it has plenty of vertical space for a single parakeet to exercise their wings. If you want a bird cage with a modern design that will look cool in your living room, you might want to consider the Vision bird cage from Hagen. Not only do we think it looks great, it also provides a ton of space for a single parakeet, so you don’t have to worry about them feeling cramped while you’re gone. The aesthetic is just a bonus, you aren’t giving up space or quality which are both more important than style – so that’s a big plus. This cage is the only cage on our list to include debris guards to help keep the mess inside of your parakeet’s cage instead of all over your floor. Whether or not it’ll work great for your parakeet remains to be seen, but it’s a thoughtful addition that helps keep things at least a little bit tidier. Also included with the cage and debris guards are 2 seed/water cups and 4 small perches. This cage measures 24.6 x 15.6 x 34.3 inches with½ inch-wide wire spacing. The bottom of the cage is protected by a debris guard to keep loose food and waste from falling over your floor. As parakeets can be quite messy, this is a great feature you’ll want to consider having. Assembly is a breeze, so you’ll have more time to play with your parakeet instead of wasting time feeling frustrated by a complicated design. With some cages, it just feels like they don’t quite fit together right unless you force it a bit, but this one just works. This cage is the perfect size for a single parakeet and even exceeds the height recommendation at 34.3 inches tall. The ½ inch-wide spacing is the perfect size for attaching accessories and keeping your parakeet safe. Now it’s time for Prevue’s second appearance on our list with their Wrought Iron bird cage. This sleek looking cage is sold in black or white and comes with a few accessories: 3 wooden perches and 4 plastic double cups for feed and water. The cage rests on a secure base that doubles as a storage shelf for supplies. Despite its large size, it’s easy to move around due to the rolling castors on the base of the cage. The bottom screen and tray slide out of the cage, a welcome feature to ensure easy clean-up of waste and contaminated bird feed. This cage measures 31 x 20.5 x 53 inches with ½ inch-wide wire spacing. This cage is a breeze to assemble with the tab design and easy-to-understand instruction guide. It’s made from durable wrought iron, so you can look forward to using this cage for years to come. At 53 inches tall, it provides ample vertical space for your parakeet to stretch their wings. The included accessories: 4 covered cups and 3 wooden perches. Not only does this save you a bit of money, but your parakeet will love having different spots to perch while in their cage. If you’re looking for a suitable home for 2 parakeets, or you want your single parakeet to live like a king or queen, the Natura Aviary from Trixie might meet all your criteria. While it doesn’t exactly follow the standard rule of 50 x 50 inches for two parakeets, it more than makes up for it in vertical space at almost a full 71-inches tall. Not only does it look stunning, but it comes packed with high-quality accessories: 2 stainless steel bowls, 2 perches, 1 climbing frame, 1 ladder and 1 feeding tray. This cage measures 30.5 x 30.5 x 70.75 inches with three different sized doors on the front of the cage to accommodate variation in bird sizes. The large doors on the front of the cage. You’ll have no trouble accessing your parakeets when you need to and there’s even a smaller door if you’re worried about escapees. The height of this cage. At 70.75 inches tall, it’s the tallest cage on our list and will provide more than enough space for your parakeet to move around while you’re away. The included accessories are a welcome touch that we’re sure your parakeet will get a lot of use out of. Not only that, there is tons of room to add additional toys and accessories! Can I take my parakeet out of its cage? Yes! It’s recommended that parakeets get at least one hour out of their cage per day for exercise and socialization. It might take some time to train your parakeet to feel comfortable leaving their cage but eventually they’ll start looking forward to their cage-free playtime. Then you will need to work on training them to go back to their cage! What is the safest temperature for my parakeet? Parakeets feel their best in moderate temperatures – that means somewhere between 60- and 70-degrees Fahrenheit. You should always avoid extremely hot or cold temperature as parakeets don’t handle temperature extremes well. Parakeets prefer living in pairs, but there are some important facts you need to keep in mind before getting a friend for your parakeet. Male pairings tend to be less dominant together, so they are the ideal choice. However, temperament can affect how well any pairing will get along, so that also needs to be considered. Female pairs are not recommended as they tend to be more aggressive with each other and will often get into conflict over territory. A male and female pairing can work, but they can get into territorial conflict disputes as well. Luckily, a single parakeet can be happy with just having you as a companion, but you should be prepared to spend time socializing with them everyday. 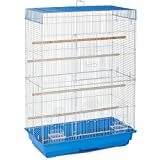 What size of cage do I need for two parakeets? For two parakeets, you should aim to have a cage that is at least 50 by 50 inches. This is double the recommendation of 25 x 25 inches for a single parakeet and should provide ample room for both of your birds to live happily together. However, like with most caged animals, if you can afford a larger cage you should go bigger. This will help avoid possible fights over space and give more than enough room for your parakeets to spend time apart as needed. What do I need to keep in my parakeet’s cage? Your parakeet will need a water dispenser (filled with fresh water daily) and a bowl for food (filled with fresh feed daily). For mental stimulation, you should keep an interesting assortment of toys inside of their cage. Popular choices include toys with mirrors, ladders, and perches. Should I cover my parakeet’s cage overnight? Yes. Like us, parakeets need a full night’s sleep to feel their best and the best way to support that is to cover their cage with a dark blanket or cage cover when they go to sleep. This helps mimic their natural environment, allowing them to relax and sleep throughout the night. For a gentle wake-up in the morning, gradually remove the blanket so your parakeet isn’t startled by the sudden brightness. Choosing the right cage for your parakeet isn’t an easy task, but we think we’ve done a good job helping narrow down your choices. Like with most pets, a larger cage is a better value for both you and your parakeet and should them happier for the years to come. Don’t forget to supplement your parakeet’s day with plenty of socialization and free-range exercise outside of their cage.